As a former elementary teacher who loves making learning fun, I am thrilled to post a review and giveaway for Dreambox Learning K-3. Dreambox Learning K-3 learns your child's strengths and weaknesses and creates an "adaptive learning environment" for your child using 500+ online lessons. If your child gets stuck on a lesson they can click the "help" button to have the instructions repeated and even click a second time for more specific advice or to have the answer shown step by step. If your child understands a concept fully, those lessons are bypassed and extra instruction can then be given specifically where it's needed. The program is continually assessing your child's comprehension based on the answers that are given, the time taken to answer and whether or not the "help" button is required to complete the lesson. Lots of Fun! -- Dreambox Learning has four main adventure themes: Pirates, Pixies, Dinosaurs and Pets. While playing, your child is rewarded with coins to use in the carnival, character cards and achievement certificates based on the adventure they've chosen. The ongoing positive reinforcement contributes to a sense of accomplishment and adds to the fun. My kids and I laugh and laugh at the 'more than / less than' game with Allie the alligator. We call out our guess of what silly phrase Allie will say next: "Delicious", "Scrumptious", "I want to face THIS way!" Foundational Learning -- Dreambox Learning teaches the basics of math -- those foundational skills that are so necessary for later mathematics. Check out the Dreambox Learning Demo to play examples of games from various grade levels so you can see how the skills build on one another. Hands on Learning is a great way to teach the why behind the answers. Through Dreambox Learning your child will use virtual "hands on learning" to show their work as they figure out addition, multiplication and even algebra (did I scare you by mentioning algebra?). I would also like the printables to be available in black and white. Kids could colour the pictures in themselves and parents could save money on the cost of ink for the printer. Desiree (grade 2) and Elijah (4 years old) are thoroughly enjoying Dreambox Learning! Elijah is not yet in school (and the program technically starts at the kindergarten level) so at first I sat with him as he played. Now I just hover nearby and give small pointers if needed. Both Desiree and Elijah have so much fun with math on Dreambox Learning that they can be on for 45 minutes or so without even noticing the time has passed. Personally, I have played over 17 hours logged in as a grade three student and I found that I am learning. I am apparently set in my ways when it comes to adding and multiplying, so it was interesting for me to learn new ways of thinking that will help me support my children's learning. As a parent, I love that Dreambox Learning is truly educational. This isn't "busy time" on the computer -- this is quality learning time. Progress updates are e-mailed to you so you can see what skills your child is currently working on and what lessons they have completed. From a teacher's point of view, I can see amazing benefits. Years ago I taught a grade 7 student who had no understand of place value whatsoever. Because she had never understood this foundational skill, everything in math was a struggle for her. She and I worked one on one with popsicle sticks and elastic bands until it started to make sense to her. 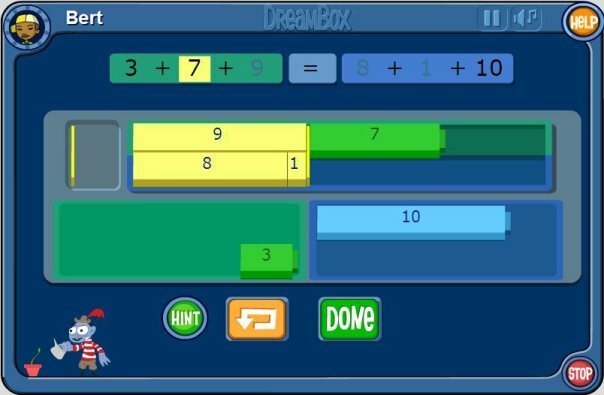 Dreambox Learning has a game that teaches place value in a similar way. As a teacher, I agree with Dreambox Learning that: "Kids who are proficient in early math are more successful in school later on." Dreambox Learning helps students build that necessary foundation for future math. Try It: Sign up for your free two week trial at Dreambox Learning. No credit card information is required so it is risk-free. Subscribe: Check out Dreambox Learning to subscribe. Subscriptions can be monthly or, for a 23-36% savings, they can be for a 6 month time span. Win It: One Sowing Dandelion Seeds reader will win a 3 month family subscription for up to four kids to Dreambox Learning ($59.85 ARV). Tell me what you'd like Dreambox Learning to help your child with ie: addition, multiplication, algebra etc. (or just an overall improvement of math skills). Disclosure: Dreambox Learning provided me with a free family subscription to review in exchange for my honest opinion. I would love to have Dreambox Learning help my child with 1st grade math skills such as measurements, chart and graph concepts, telling time vocabulary, etc. I'd like Dreambox learning to help my middle child master addition and get a head start on subtraction. And I blogged (thanks for submitting this!). And I already commented on the Ultimate Blog Party post. Having fun with that...hope you are too! I'd really like to just improve my little girls overall math skills. Although subtraction is the toughest for her. I would love to have any help with addition for my little boy. Great giveaway! Thanks so much! I follow you on Twitter (I'm wowtotweet). I would love with some help in math for the kids. My lil guy is just starting to learn & I want to offer him all the help I can get him. I like sowing Dandelion seeds on Fb! I like dreambox learning on Fb! I follow dreambox learning on Twitter!